Embracing Digital Innovation Exchange and Discover your Digital Muscles! Flexing your Digital Muscles: Insights into market trends, business drivers, challenges and success factors of Digital Transformation. Enabling Digital Disruption: Understand how organizations are embracing Cloud, AI, IoT, Big Data, Blockchain, Cybersecurity, Quantum Inspired Computing as essential elements of their digital workout. Results of Fujitsu's Global Digital Transformation Survey not only reveal the current digital state of play across the globe but also offer a guide to the critical success factors for real digital transformation. 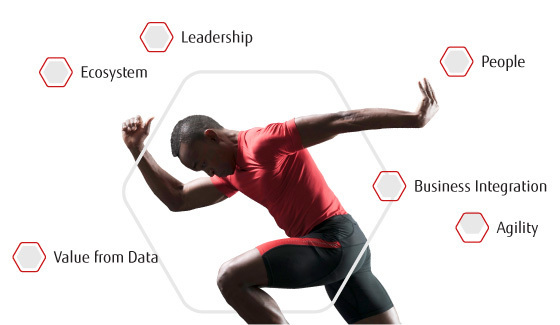 Fujitsu Technology and Service Vision is realized by combining three key value drivers: the creativity of people, intelligence derived from information, and connectivity of things and infrastructure. Learn how our unique approach can create business and social innovation by empowering people with advanced technology. Creativity drives disruption, change and transformation. How can you harness creativity and knowledge to empower people to innovate? Digital co-creation is the best route to growth. Fujitsu, the Fujitsu logo and "shaping tomorrow with you" are trademarks or registered trademarks of Fujitsu Limited in the United States and other countries. All other trademarks referenced herein are the property of their respective owners.